On April 24, 2017, Robert Paige received a call at his home asking if he knew how to use the AED which he had donated to his local gym. The caller stated that a male was unconscious on the floor at the gym and that EMS was approximately 10 to 15 minutes away. He immediately left in his vehicle, arrived with oxygen only two minutes later, joined in lifesaving efforts and started the AED. Following the AED’s prompts, he started compressions, inserted an oropharyngeal airway and administered oxygen. Emergency medical services arrived and requested that Robert continue chest compressions and then assisted ventilations with a bag-valve mask (BVM) while loading and transporting the patient to the ambulance. He then accompanied the patient in the ambulance to continue BVM ventilation support. During the journey the patient experienced a seizure; Robert continued his efforts to ensure ventilation support was not interrupted. At the hospital staff asked Robert to continue this support while intravenous and ventilator support were established. In total Robert delivered chest compressions and BVM ventilation support for two hours. On April 27, Robert met the patient who was alert, sitting up in the company of his spouse and other members of his family. The attending physician and nursing staff also attended to meet the volunteer first aid provider who’s generous AED donation and prompt and effective care contributed to the patient’s life being saved. The patient has fully recovered and can still enjoy time with his family. 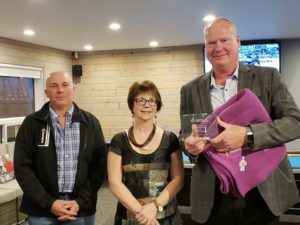 For Robert’s actions, he was awarded the John D. Harper Lifesaving Award at this year’s Canadian Ski Patrol Altitude national conference in Quebec City.